The Winn Parish USGenWeb Project page has a large amount of resources for research into the vital records and genealogy of the parish. Also, the Winn Parish Clerk of Court can be contacted for more information at winncoc@suddenlinkmail.com. The Clerk is located in the Winn Parish Courthouse in Winnfield, LA., on 100 Main Street. 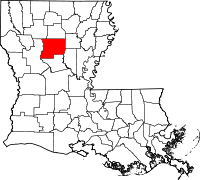 Winn Parish, home to the well known and assassinated state governor Huey Long, was founded in 1852 and was one of the few to vote against secession from the Union in the days preceding the Civil War. Winn Parish is also home to the Saline Bayou, a tributary of the Red River and a popular boating and fishing area in the region, which runs through the Kisatchie National Forest, a 604,000 acre forest run by the United States Forest Service. Only part of the forest is located within Winn Parish, however.